The upcoming documentary film Music is the Medicine is not only the story of Six Nations blues artist Derek Miller, it is in fact the origin of RPM. Music the Medicine is about to have its world premiere at the imagineNATIVE festival in Toronto in two weeks. In celebration and support of the film, RPM will be bringing you a series of exclusive content on Derek, the film and the filmmakers, from now, through the festival premiere and up until the film airs on APTN next month. 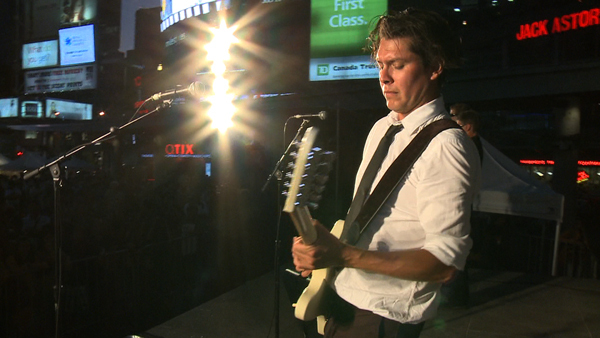 In the film, Derek talks about his experience of hitting the glass ceiling in the music industry – that being labeled as an Aboriginal artist has limited the audience his music can reach. He’s won numerous Juno awards in the Aboriginal category (and countless other music awards from Native organizations), but is snubbed by the blues and rock nods. Radio stations have not programmed his fantastic music - songs that are backed by mainstream hard hitters Double Trouble, and even a duet with Willie Nelson – citing that they don’t have an “Aboriginal hour” in their programming. Derek has endless love, support and accolades from within the community, but why is the line drawn there? Derek isn’t the only artist facing this kind of discrimination. Other artists find themselves locked in the same pigeonhole. Meanwhile, a contemporary platform for Indigenous artists didn’t exist online. You couldn’t Google Indigenous music without coming to a static site flaunting a dreamcatcher or eagle feather in their logo – images not representative of all Indigenous cultures, first of all, and not representative in any way of the diverse, rich, music being made by Indigenous artists the world over. When there isn’t a decent resource to even find Indigenous music, where does one begin to change the stereotypes held of Native music and musicians? How can we shatter those preconceived notions? How can we connect and support Indigenous artists and provide a relevant and engaging platform for listeners, artists and fans alike to get great music? Those questions were the seeds of RPM. Initially, the producers of Music is the Medicine, Make Believe Media, launched MBM Digital to create a new media project to support the film. But as these questions and the obvious need to fill this gap in Turtle Island’s digital territory arose, MBM Digital’s brainstorming brought them to what is now RPM.fm – Revolutions Per Minute. Thank goodness it did. Since RPM’s soft launch in June the response has been fantastic. We’re so glad. And we’ll be coming at you this month with the official, big splash, launch of RPM with new features and our own launch celebrations and we chose this time to coincide with Music is the Medicine’s own splash into the world, in honour our of connection and beginnings. Watch this space for more on Music is the Medicine, Derek and RPM’s launch party! Music Is The Medicine Trailer from Make Believe Media on Vimeo.